Xara Photo & Graphic Designer 9 is a graphics software program and photo editing tool. It sports such features as non-destructive photo handling, Magic erase, Intelligent scaler, Bitmap tracer as well as more graphics orientated tools such as Advanced text handling, 3D Extrude and Animated flash export. In this review, we'll examine the new features in this ninth version as well as covering common features for newcomers to the program. 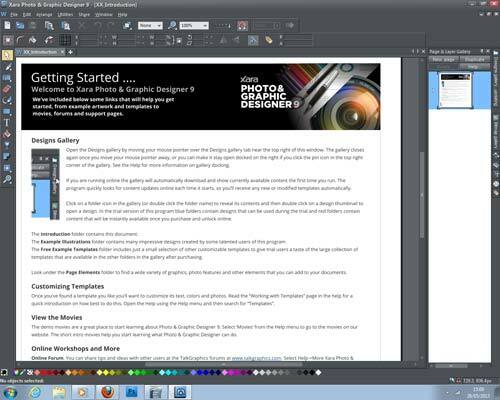 Xara Photo & Graphic Designer 9 costs around $99.99 (£66.15) and can be downloaded from the Xara website. We downloaded Photo & Graphic Designer 9 from the Xara website and with a 1Mb broadband speed, it took around 19 minutes to get it on the computer. Arguably, the easiest way to do this is by getting it on a trial period. You can use it for free to see if you like it, then input the licence code at a later date. Alternatively, if you've already purchased it you get the option to input the code while installing. The full install once downloaded takes around 4 minutes including extracting the files. After that, it's then that you get the opportunity to put the licence key in if you have it and register your details. The main page will load up with an introductory message that holds a few useful tips for getting started. 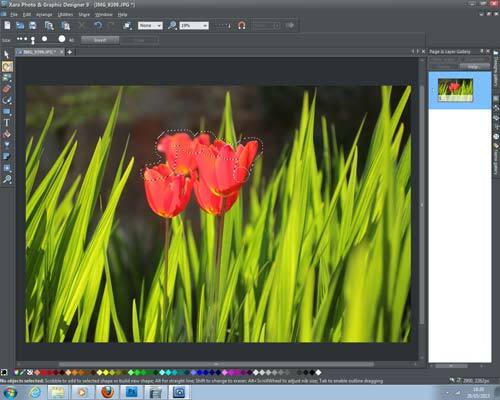 The layout of Photo & Graphic Designer 9 is typical of photo editing suites such as Adobe Photoshop with the drop down menus in the top left of the window, a few frequently used tools in task bars underneath and the main tool pallet on the left side of the central pane. To the right, there's a number of galleries to help you get through some of the projects you'll be using. The Design gallery will be the most frequently used of the seven available as it holds all the templates for projects such as photo albums, calendars, business cards or greetings cards. One great touch is that in the Fonts gallery, it's not just preloaded fonts that come up. Photo & Graphic Designer 9 will read your fonts folder and load any that you've downloaded from the internet. Editing photos in Photo & Graphic Designer 9 shouldn't be too much of an issue. The program is non-destructive so you won't get a loss in quality and the original image won't be changed either. The support for Adobe PSD files helps with this. It means you can retain layers on images manipulated in Photoshop and then open them up in Xara. However the file opened up in Xara will convert to a .xar file which isn't recognised by Photoshop. To make sure you can then flick between the two programs, you need to select Export from the File tab. Choose the destination for the saved file and choose Adobe Photoshop (psd) from the drop down list of file types. That's a bit of a long way round doing it and it's a shame it can't be done simply by using the Save button. 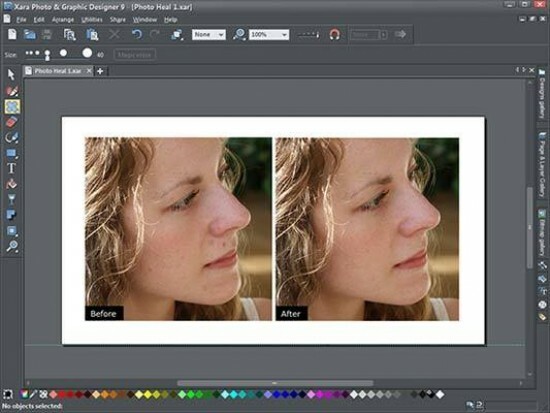 Because Xara were acquired by Magix back in 2007, the graphic design software company has integrated a lot of cool features into Photo & Graphic Designer 9 to make your job faster, smoother and less stressful. While loading pictures in from a folder – especially a slower one such on a memory card – we noticed a massive increase in responsiveness and speed on the Xara software compared to Adobe Photoshop (CS4). 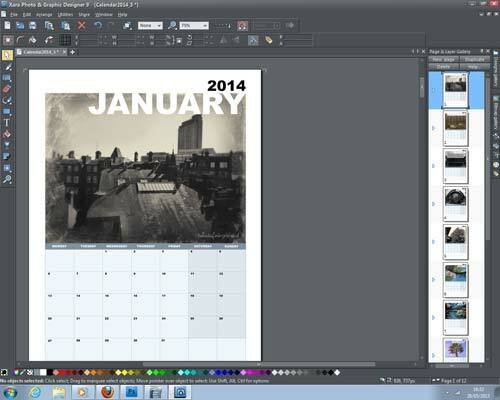 Let's take a look at a couple of cool features available on Xara Photo & Graphic Designer 9. We watched the tutorial video of the Magic Photo Erase tool on the Xara website and it scared us a little bit at how easy it seems to be to drastically alter your photographs. However on closer inspection, it's a simple patch tool that has been enhanced to blend the edges more intelligently than the one found in Photoshop. It works the same way, though, by selecting the area you'd like removing and dragging the mouse to the place you'd like to clone. What we do like about it is that the selected area (marching ants) can be manipulated by expansion, rotation and inversion. Another feature that looks pretty cool but is also on Photoshop is the Content Aware rescaling. It allows the size of the photograph to be increased using stretching methods without adjusting the size of the subject. It's a lengthy process as you have to prepare the image where the program will analyse the picture pixel by pixel. Even Xara recommend resizing the image before pressing Prepare if you don't need a full resolution image. 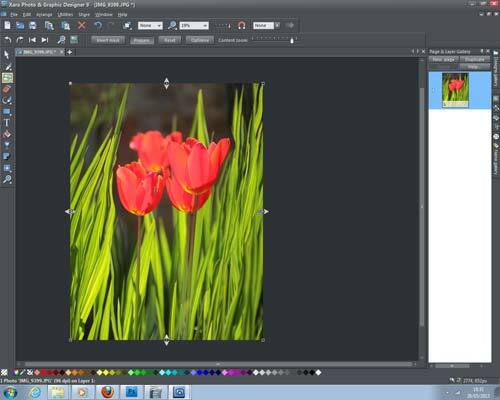 Preparing the image adds additional information so that once it's done and you open that file in Photo & Graphic Designer 9, you won't have to do it a second time.